When summertime temperatures soar, many beachgoers look for alternate ways to cool off. Both Gulf Shores and Orange Beach offer a multitude of activities for water-loving visitors. Get ready to splash in the surf, paddle off into the sunset or even soar high above the water on your next beach vacation with these Orange Beach water sports along Alabama’s beaches. Orange Beach Cat Boat Tours is a unique experience in a zippy, yet stable boat with a tour guide who fully narrates the one-and-a-half-hour adventure. It’s a great way to get back to nature, see some wildlife and spend time on Alabama’s coastal waterways. You pilot your own vessel, which adds to the excitement. Each cat boat seats two people. Established in 2017, cat boat tours have quickly become one of the most popular Orange Beach water sports options. Standup paddleboarding (SUP) is all the rage in water recreation, as is kayaking. Both of these water toys can be rented from various outfitters for watersports on Alabama’s beaches. If balance and adventure are your strong suit, SUP may be just the thing for fun in the sun. 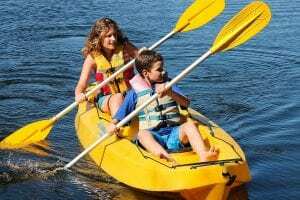 Kayaking is also an exciting way to explore the waterways in Gulf Shores and Orange Beach. Both SUPs and kayaks are available for rent directly in front of Turquoise Place by Perdido Beach Services. There’s no reason to leave the resort to enjoy a day of water adventure. If you prefer a guided tour rather than going solo, there are plenty of options available. While on an Orange Beach vacation at Turquoise Place, call Captain Glenn of Coastal Kayak Excursions. The captain will lead you on a three-hour guided eco-tour of the back bays in Orange Beach. You’ll likely see dolphins swimming nearby and other local marine life, as well. For those vacationing in Fort Morgan rentals at The Beach Club Resort & Spa, don’t miss the opportunity to kayak with WildNative Tours. Float along the waters of the Bon Secour National Wildlife Refuge and enjoy a peaceful afternoon on the water. Bring your camera (and a dry bag) to capture picture-perfect shots of the flora and fauna of this protected area. 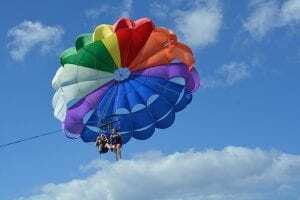 Parasailing is almost as much fun to watch as it is to participate in. Flying high above the beach offers a bird’s eye view of the area. Hop aboard a boat and soar the length of five football fields in the sky. Typically, you can ride single, double or triple. At Turquoise Place Resort, you don’t even have to leave the Orange Beach resort to get your adrenaline pumping. It’s available right from the beach. Jet Skis are a fun adrenaline rush with waves splashing and the thrill of driving your own watercraft. Just like parasailing, Jet Ski rentals are located onsite through Perdido Beach Services at Turquoise Place Resort. At Turquoise Place, you may recognize Perdido Beach Services for their beach chair rentals, but did you know they rent catamarans (oversized, cool-looking rafts with sails on them)? 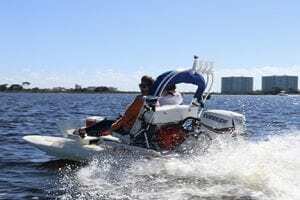 Exploring the waters of Orange Beach has never been so exhilarating! Perdido Beach Services also gives surfing lessons. Yes! You can hang 10 with other surfing newbies and learn to ride the waves with style. 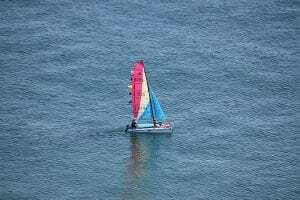 There are so many fun ways to spend time on the water during an Orange Beach or Fort Morgan vacation. Discover all of the fun you can do at our Orange Beach luxury resort!